Welcome to the Diagnostic Radiologic Technologists Virtual Guide to Radiographic Positioning. This guide was created and designed by Technologists and Clinical Instructors to assist you during your everyday functions. As you may already know, Radiographic positioning is the backbone to diagnostic radiography. 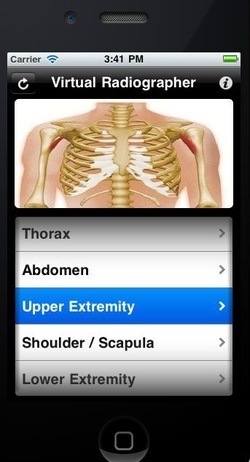 Utilizing these enclosed positions, along with a basic knowledge of anatomy and physiology, you will be able to use this guide to produce a quality diagnostic image, which will allow your radiologist to generate an accurrate diagnosis.This simple and user friendly App, which includes a detailed Glossary of Medical Terms , will put you at ease when performing simple cases or very difficult procedures that you may not be familiar with or might have forgotten. The Virtual Radiographer positioning guide, contains your everyday tools, placing the knowledge of textbook like material within your fingertips before radiographing a patient. Below are a few tools that are bundled into the App. 20. U.S. State Radiological Bureau Contact Info. Copyright 2010-2011 RRC, Inc. All Rights Reserved. US Patent Pending.